God has clearly used signs and wonders in the past. The Old Testament prophets demonstrated signs and wonders. Jesus did many signs and wonders. The ultimate sign is the “sign of Jonah” which is the resurrection of Jesus when he came out of the grave as did Jonah out of the large fish. Other signs cannot compare to it. We did not see this event ourselves but we have the testimony of those who did. Thomas doubted at first, but when he saw the risen Lord he worshiped Him. We are privileged to believe the testimony of the apostles. We have the biblical record of their experience with Jesus before and after His resurrection. We see dramatic changes in the lives and ministry of apostles. “At that time, if anyone says to you, ‘Look! Here is the Christ!’ or ‘There he is!’ Don’t believe it. We cannot worship signs and wonders. Some are real, but some are not of God. We must examine the sign or the wonder. Was it disruptive to the worship. Did help it bring about a healing or deliverance? Did it help lead someone into a decision for Christ? If not, it was Satan’s distraction. 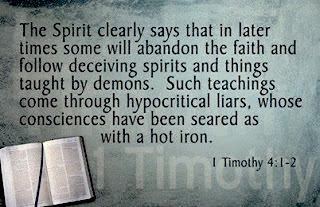 Discernment is required. God will give us that discernment if we worship Him with all our heart.